Ben Bender of TapSnap Philly was recently offered a great opportunity to work a six store event for Mealey's Furniture. Mealey’s plans to hold their "Find the Elf on the Shelf" event at stores across Pennsylvania and New Jersey on December 6th. 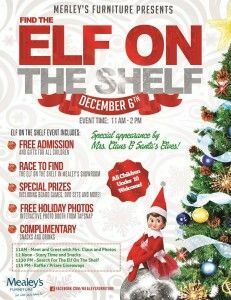 The event features free admission and gifts for all children, a race to find the "elf on the shelf" in each Mealey's showroom, prizes, snacks and drinks, a special appearance by Mrs. Claus and Santa's Elves, and holiday photos by TapSnap Phototainment. Ben knew it would be a big effort to manage six locations at once, and in the spirit of the holiday season sought to share the wealth of his opportunities with his fellow local franchises. One of the strengths of the TapSnap franchise is that it continually develops strategic relationships with large brands with multiple locations in order to provide events for numerous franchisees. This six store event is one of the most recent examples of both TapSnap franchisees working together as a team and the way success for any one franchise benefits all franchisees as a whole. Ben will staff two locations, while Dan Clay (TapSnap 1042), Miquel McDonald (TapSnap 1091), Mari Killian (TapSnap 1069), and Karen Kozeniewski (TapSnap 1106) will provide Phototainment at each of the other four locations. If you live in Bensalem, Berwyn, Fairless Hills, Warminster, or Whitehall, PA, or Maple Shade, NJ, be sure to check out any of the six Mealey’s Furniture Showrooms to see TapSnap in action.